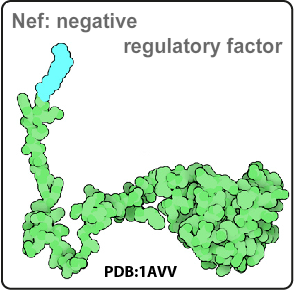 Nef expression promotes virion infectivity. It acts by preventing transport to plasma membrame of several host cellular proteins. Nef induces the endocytosis of MHC-I molecules. When a cell is infected, foreign antigens associate with MHC-I molecules and are recognized by and induce the cytotoxic T lymphocytes (CTLs) immune response and cell lysis . Nef binds to the clathrin adaptor protein-1 (AP-1) and MHC-I to form a stable complex that allows AP-1 to direct MHC-I endocytosis and degradation. Nef reduces MHC-I at the cell surface but synthesis and presense of MHC-I at the ER and Golgi apparatus occur normally . Nef downregulates CD4. Nef binds to AP-2 and hijacks AP-dependent trafficking pathways for CD4 downregulation . The interaction between Nef and AP-2 forms a stable complex with surface CD4 molecules and induces the endocytosis and lysomal degradation of CD4. Nef binds to and modulates T-cell antigen receptor (TCR) signalling . 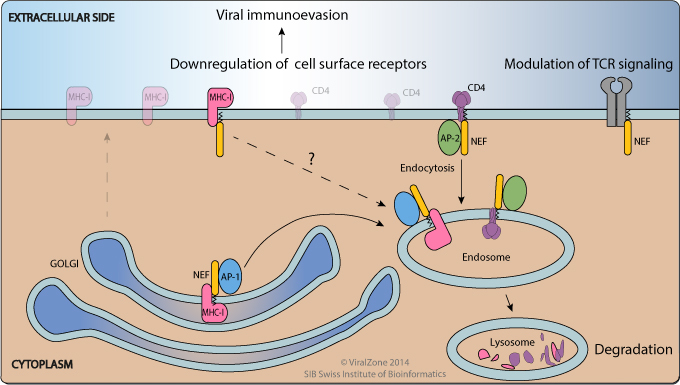 Nef promotes exclusion of SERINC5 and SERINC3 from virion incorporation , thereby preventing the negative effect of these host proteins on virion infectivity.